Practitioners frequently ask about the relationship between taiji and qigong. Different people have differing opinions. And the same person might have different understandings as their study deepens. I would like to share my thoughts on this issue. This topic could easily fill a book, but I will try to be succinct. The word qigong was not popularly used until the mid 20th century. 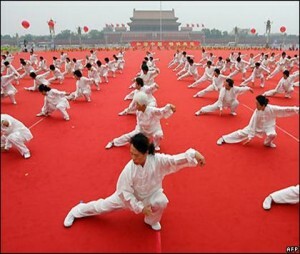 Before then, different qigong exercises were known by the myriad names, or categories, of exercises. Qigong literally means to exercise, or nurture, qi, which is the energetic intermediary between physical essence (jing, 精) and spirit (shen, 神). But a simple literal interpretation of the word qigong is insufficient to convey the full meaning. 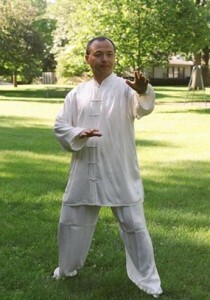 Qigong is mind/body/spirit integrative exercise—any mind/body/spirit integrative exercise is qigong. Taiji form (if practiced correctly) is one type of qigong, but other basic qigong exercises are also essential components of traditional taiji training. Yoga is qigong; simple exercises such as walking or riding a bicycle, or even many daily life activities, if done in awareness and understanding of qigong principles, can be qigong. Qigong, then, is a big-picture concept. In traditional practice, there are two basic categories of qigong practice: static and dynamic. Static qigong refers to meditation in sitting, standing, and lying-down postures. These are the most fundamental, and therefore the most essential, qigong training methods. Dynamic qigong refers to moving meditation, which as stated can be in many forms. “Wuji is the mother of taiji” (or “taiji comes from wuji”) is a very famous saying in taiji practice. But few people understand how to translate this saying into practice. As a result, some, if not most, practitioners spend their time practicing taiji forms but never experiencing wuji, the foundation of taiji practice. Wuji is realized in deep meditation and is practiced in sitting, standing, and lying down meditation exercises. Indeed, meditation is called “wuji” in traditional practice. To return to wuji is the goal of meditation (or, to be more accurate, some forms of meditation — keep reading to see what I mean). Other traditions may use different words (e.g. calm abiding), but the meaning is the same. 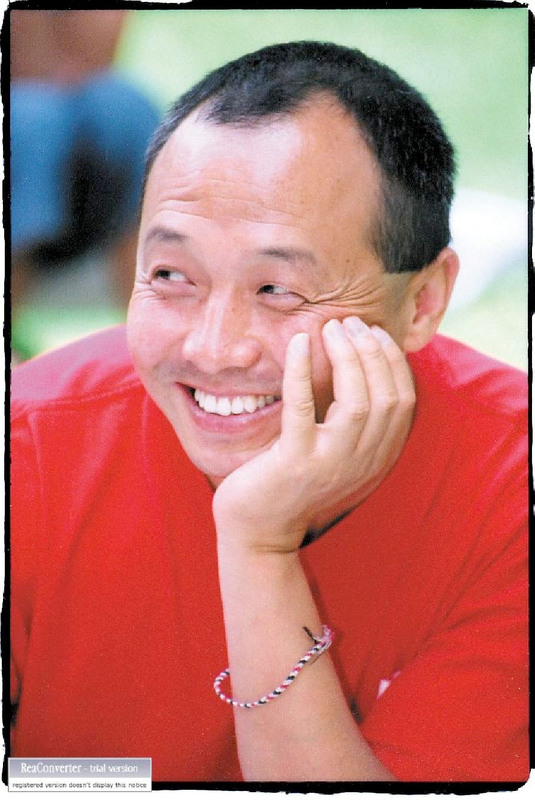 Wuji is a profound state of mental and physical relaxation, of mind/body/spirit integration. To experience wuji is to know the bliss of a mind undisturbed by ego, by thoughts of judgments of good/bad or attraction/aversion. To realize wuji is to feel the energy of the universe in you. This energy is the mother of taiji. When the energy is full, it is natural to want to move. Once the intention of movement arises, the energy is separated into yin and yang (soft/hard, left/right, up/down, store/release, etc. ), and taiji movement is born. After moving it is natural to return to stillness. This is one example of the wuji/taiji/wuji progression. Ultimately, words and rational thinking are inadequate to convey the feeling of wuji. How do you describe the taste of sugar? Wuji can only be known experientially. How to efficiently practice the meditations and realize wuji is another subject, one which I have touched upon in previous training tips. The thing to understand is that the many different meditations are techniques to lead you to stillness, but quiescence is the common destination of all. So the standing, sitting, and lying-down meditations are wuji practice, and are the beginning point for efficient taiji practice. Understand, however, that in wuji one has deep awareness of being (for all but adepts a much deeper and more profound awareness than the daily mind), but no intention to “do” something. Once the intention to do something arises it is no longer wuji, but rather the transition to taiji movement. Intention is of course an important aspect of taiji practice, and there are also essential standing and lying-down meditations which utilize intention to focus or direct the energy. And so while wuji is practiced in standing, sitting, and lying down meditations, not all static meditation exercises are wuji practice. Following are the different static and dynamic qigong exercises in traditional taiji training. (static sitting, standing, and lying-down) – the “mother of taiji,” this is the deepest level of energy cultivation, and of mental/spiritual awareness. For taiji practice in particular, the static meditations have the following purposes. Sitting meditation is the best modality to train your mind: awareness of reality and mental principles. In addition, it increases awareness of your physical body. It also enhances your nervous system, which increases your reaction time. 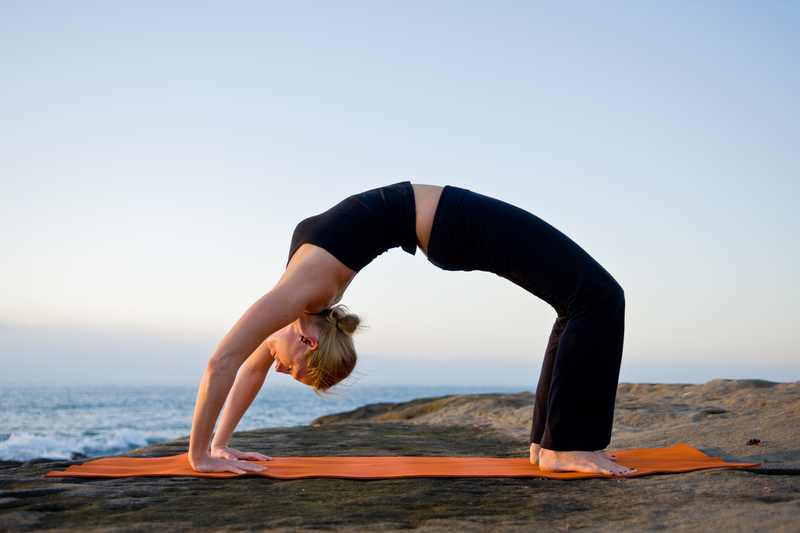 All contribute to the ling (agility) quality of your practice. The ability to move with lighting quickness, and to perceive a situation or even to foretell an occurrence, is an aspect of ling. In the taiji classics, the saying “the opponent moves, I move first” is a description of ling. The often held secret in taiji tradition is that this skill comes from sitting meditation. (The problem with secrets is that, if they are not made common knowledge, they are eventually lost.). Standing practice primarily develops your strength, alignment, posture, economy of movement, and sleep quality. Lying-down practice will help with your sleep, relax your mind and body, and, importantly, prevent overuse of the body and injury. Actually, the more adept you become at taiji movement, the more you need to incorporate lying-down to prevent over-use of core musculature. With this foundation, you can start to incorporate the “gong” derived from meditation into movement. (e.g. dynamic qigong exercises such as Grand Open & Close, Circulating Qi, etc.). Here we begin to incorporate fundamentals of, stance, posture, and weight shifting/waist turning/chest opening and closing with yin/yang taiji movement and reverse breathing. There is nothing new in the taiji form in terms of stance, alignment, coordination, silk reeling energy, application, etc. except the choreography. Taiji form is complex movement and must be learned. The “eight forces” (peng/lu/ji/an/zi/lie/zhou/kao) and “five cardinal directions” of taiji movement, in combination, ultimately contain all possible lengths and directions of human movement and force generation, and so contain virtually all possible (standing) martial applications of the feet, knees, hips, body, shoulder, elbows, and hands. I have never seen a (standing) martial application that is not contained within the 48 and pao cui forms. Finally, you can apply physical quality cultivated in the form practice to daily activities: your jogging, dish washing, vacuuming your house, holding a baby in your arms, gardening, even waiting in the grocery line. It is a higher level of practice as the application is random. And it is the ultimate goal of practice: to improve the quality of daily life. Mentally and spiritually, you are applying the awareness and mental principles to your daily life while you interact with family members, colleagues at work, and strangers on the street. All of the above are qigong – all are energy nurturing, mind/body/spirit integrative exercise at their deepest levels. The exercises are interrelated and interdependent – it is the combination of exercises that yields efficient practice and realization of the widest benefits of practice. This entry was posted in From the Master and tagged eight forces, exercise, five cardinal directions, ji, jing, meditations, mind body spirit, no extreme, nuture, Qi, Qigong, spirit, taiji, wu, wuji. Bookmark the permalink. 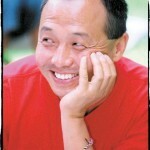 Im a 6 year ongoing qigong practitioner. I really enjoyed the article above. It reasonates with my own practice. Thank you. Perhaps one of the best descriptions of wuji and taiji that I’ve ever read. Your posting really sthagirtened me out. Thanks!